Armor of God Bingo Cards to Download, Print and Customize! 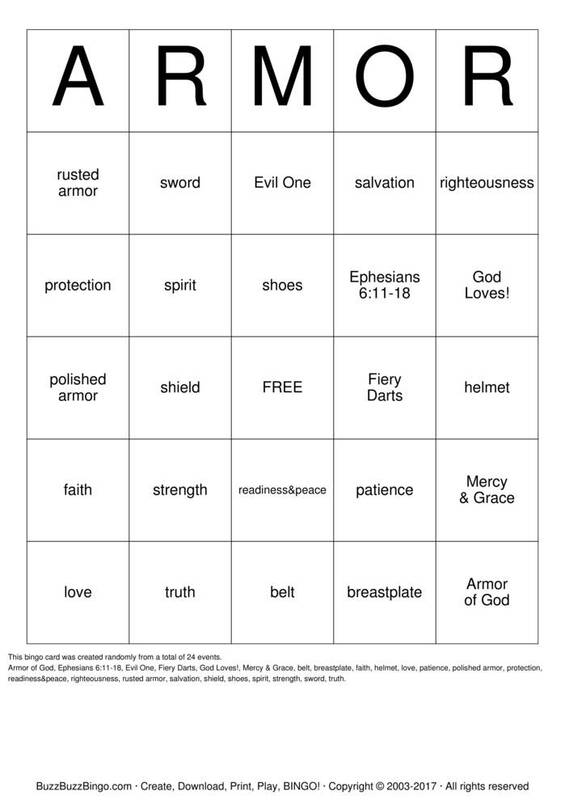 Print 2 pages of Armor of God Bingo Cards for free. Download a PDF with 2 free pages of bingo cards plus instructions and a randomized call sheet. Play Armor of God bingo in a browser or customize the events, free space, etc. Purchase more randomly generated bingo card pages below. Armor of God, Ephesians 6:11-18, Evil One, Fiery Darts, God Loves!, Mercy & Grace, belt, breastplate, faith, helmet, love, patience, polished armor, protection, readiness&peace, righteousness, rusted armor, salvation, shield, shoes, spirit, strength, sword, truth.